Automotive pinion gears are the driving gears in the drive train and are used for the transmission of the motion in the automobiles. The major parts in which the pinion gears are used are steering system, transmission system, and differential of the vehicle. The primary function of a pinion gear is to transfer the motion to the bigger gear in the assembly. Automotive pinion gears are generally made up of alloys of Steel, Aluminum, Magnesium, Manganese, Zinc, Chromium, Nickel and Cobalt. Increasing production of vehicles with automatic transmission system, and four wheel drives is boosting the pinion gears market due to its application in these systems in higher quantity. The vehicles used for the off road rides and vehicles used by the armed forces are mostly four wheel drive which uses more number of differential than the two wheel drive vehicles which utilizes bevel pinion gears, hence is responsible for the growth of the pinion gears market. The increasing demand for the vehicles with automatic transmission system due to its better fuel economy and ease in driving even in heavy traffic conditions is contributing to enhance the automotive pinion gear market. Mentioned factors are likely to boost the automotive pinion gear market during the forecast period. For the purpose of the study, the global automotive pinion gear market has been segmented in terms of gear type, vehicle type, application, and geography. Based on gear type, the global market is bifurcated into bevel and helical pinion gears. Of these, helical pinion gears accounted for the leading share in the global market in 2016. The rising use of helical pinion gears in transmission and steering systems has enabled the segment emerge at the market’s fore. In terms of application, transmission system, differential, and steering systems constitute the key categories. On the basis of vehicle, the global automotive pinion gear market is classified into passenger vehicles and commercial vehicles. Of these, the passenger vehicles segment encompasses sedans, hatchbacks, and multi-utility vehicles. Likewise, the commercial vehicles segment comprises heavy duty and light duty vehicles. Automotive pinion gear market has been segmented into five key regions in the region segment as North America, Latin America, Europe, Asia Pacific, and Middle East and Africa. The analysis based on the region is done on the basis of the production trend, political reforms, regulation changes and society demand. 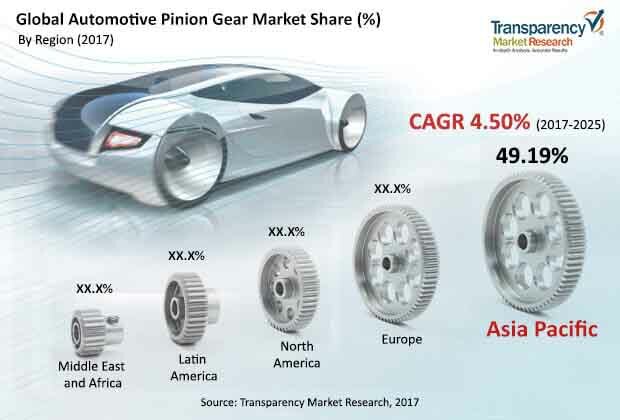 Asia Pacific has emerged as the major market for the automotive pinion gears followed by the Europe. Asia Pacific is expected to remain the largest market during the forecast period due to the high number of manufacturing facilities, increasing urbanization and purchasing power of the society and increasing production of the vehicle in the China and other region of the Asia. Automotive pinion gear market is a fragmented market and is distributed among many small and medium scale manufacturers. Some of the prominent players of the automotive pinion gears market are Bharat gears, SHOWA Corporation, Renold Plc, B & R Motion Gears, Samgong Gears, Mahindra Gears, Eaton, Precipart, Gear Motions, BMT International SA and others. This report analyzes and forecasts the market for automotive pinion gear market at the global and regional level. The market has been forecasted based on revenue (US$ Mn) and volume (Units) from 2017 to 2025. The study involves the effect of all the factors which can shrink or lift the pinion gear market globally as well as regionally. The report also highlights opportunities in the automotive pinion gear market at the global and regional level. The report consist value chain analysis, which provides a comprehensive view of the global automotive pinion gear market. Porter’s Five Forces analysis for the automotive pinion gear market has also been included to help in understanding the competitive landscape in the market. The study encompasses market attractiveness analysis, wherein end-users are benchmarked based on their market size, growth rate, and general attractiveness. The study provides a decisive view of the global automotive pinion gear market by segmenting the market in terms of gear type, application, vehicle, and region. These segments have been analyzed based on present and future trends. Regional segmentation comprises of current scenario along with forecast of the of the automotive pinion gear market. The forecast given is based on the compilation of the current trends as well as the expected scenario in future due change in technological, geographical, political and economic factors. The report provides the estimated market size of automotive pinion gear market for 2016 and forecast for the next nine years. The global market size of automotive pinion gear has been provided in terms of revenue (US$) and volume (Units). Market figures have been estimated based on gear type, application, vehicle type, and regional segments of automotive pinion gears market. Market size and forecast for each major segment have been provided in terms of global and regional/country markets. The study includes profiles of some major companies operating in the global automotive pinion gear market. Being a very fragmented market there is not any such major market share holder, however the company profile of some of the players of the automotive pinion gear market from different region is included such as Bharat Gears, SHOWA Corporation, Renold Plc, B & R Motion Gears, Samgong Gears, Mahindra Gears, Eaton Corporation, and Precipart. Market players have been profiled in terms of attributes such as company overview, financial overview, business strategies, and recent developments. The market for automotive pinion gear is primarily driven by rising demand for automatic transmission system, four wheel drive vehicles, and increasing production of the vehicles.